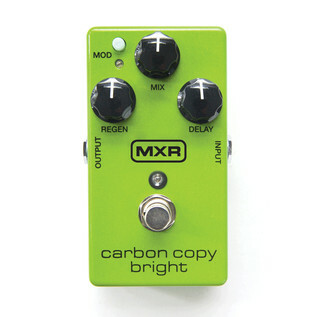 The MRX M269SE Carbon Copy Bright is a brand new edition of the legendary Carbon Copy delay pedal which utilizes a fine-tuned analog circuit to produce an impressive delay with a bright and crisp tonal characteristic. With Regen, Mix, MOD and Delay controls the Carbon Copy Bright can provide a range of unique delays and offers a delay time of 20 to 600ms. Housed in a compact and robust steel construction and finished in a bright green colour the Carbon Copy Bright is a must have for every pedalboard.